Because of my ever growing relationship with one of my favorite up and coming brands, Julep, we've decided to team up and offer one fabulous TFD reader 4 bottles of their choice of color. 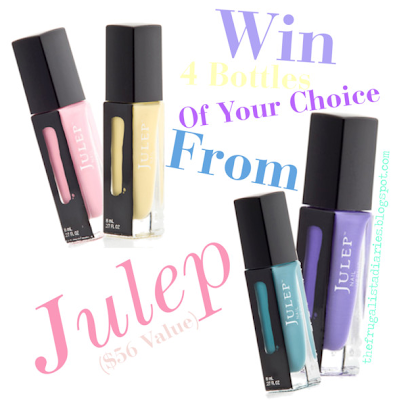 And with over 50 colors to choose from it's going to take an afternoon to decide which Julep hues you want to win! All Must Be Done by Feb. 20th at 11:30Pm to be eligible to win. Goodluck! How could you choose just 4? I have not yet had the opportunity to try Julep (YET! ), but I am still excited to participate in this giveaway. I want nail polish! So pretty! Woohoo, what a great giveaway! Made a blog post about it. Nice giveaway! Hope I win! The colors get me excited for spring! I don't own any Julep :( Help me out pleaseeeee. I *just* got notification for my first Julep shipment and I'm really excited to try them out!! I'd love to win to add more to my collection!! I'm obsessed with Julep!! Thanks for an amazing giveaway! I don't know how to post the link....seriously a rookie at this stuff. I promise I tweeted the giveaway...@BeeterHoops. I have yet to try their polishes. Never had a chance to try the jULEP brand but would love to---- I put this on my tumblr! I love nail polish! But I don't own Julep yet, I would love to try it!! I shared the giveaway on my Facebook page. Thanks for the great giveaway! I like the colors on your picture, too! Awesome giveaway Meganshared this via twitter! Stunning colors!! I would love to win!! Great colors, I'm very curious about this nail polish brand, heard so much about it! I've never tried this before, so I'm super interested in it! Would love to win! I tweeted about this lovely giveaway! Gorgeous! I tweeted: http://thefrugalistadiaries.blogspot.com/2012/02/giveaway-4-bottles-of-julep.html Thanks, Megan! Thanks so much! I love those colors! Always wanted to try Julep.